There was a time when velocity wasn't the first measuring stick used when scouting pitching arms. There was the belief that if a teenager had respectable velocity, that it would eventually develop to major league caliber. Everyone can hit the fastball, but off speed stuff, breaking pitchers and overall deception played a major role when recruiting arms. Not so much anymore. In 2007 there were only eight major league starters that had a fastball that averaged more than 95 MPH. By 2014, that number rose to twenty. The radar gun readings were difficult to find on major league scoreboards in the 1990s. Now they are a "must see" for fans watching the game in house. Today when evaluating pitchers, the first measure of consequence for scouts is based on the speed from the radar gun. If you are not hitting 90 on the gun, you probably don't get a second look. This has resulted in the increase in injury and the meteoric rise of ulnar collateral ligament surgery, most commonly known as Tommy John surgery. As of 2014 it is estimated that 33% of all MLB pitchers have had TJ surgery. In fact, most teams believe that it is only a matter of time before every pitching arm breaks down and requires the procedure. How much of this has to do with overthrowing is unknown, but I'd speculate that the radar gun infatuation of scouts is a major cause. Then there is the recklessness of young kids who will air it all out in efforts to gain scouts attention because they al know that if they are injured, there is TJ surgery around that can fix them. 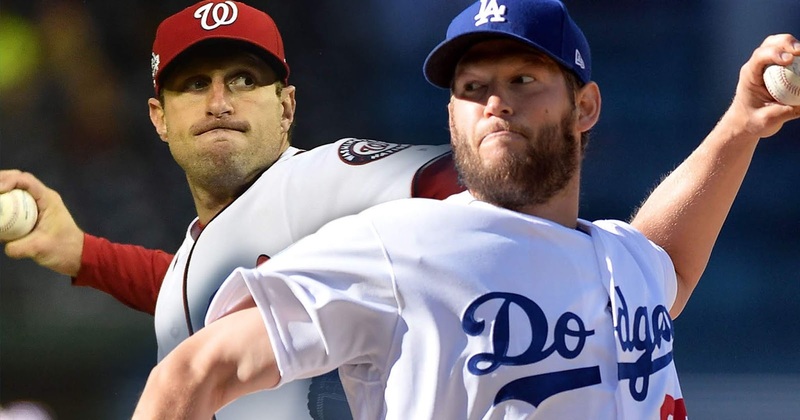 As of today, August 25, 2018, there are only three pitchers in the National League that will likely hit the 200 innings pitched mark. Scherzer (with 181), deGrom (with 174) and Nola (with 169). Perhaps Greinke hits the mark as well, but he'll need to step up his game in his final six outings and average 7 innings per game. Such is the stat of the modern starting pitcher. Arms are fragile, a lot of money is invested in them and management of teams takes a cautious approach to ensure they are able to get their money's worth for these high salaried elite starters. The recent decrease in innings pitched by starters most likely will result in decreases in money spent on these elite starters. As great as Clayton Kershaw has been, his decrease in innings combined with his fragile back and plantar fasciitis has definitely lowered his stock as an elite starters. I doubt he opts out of the $71 million remaining on the final two years of his deal. Seriously, who is going to be willing to pony up more than $35 million a year for a 31 year old pitcher that hasn't pitched enough innings two of the past three seasons to qualify for the ERA title? As of July 24, 2018, forty-one position players had taken the mound in what was essentially mop up duty in blow out games. The previous record for a season was 2017 when 31 position players pitched. Then there was the concession game where Dave Roberts put Enrique Hernandez on the mound when he ran out of pitchers in Philadelphia, coughing up the 16 inning July 24th game as a result. Don't be surprised to see multi-dimensional players that can pitch and hit in the near future. Guys like Shohei Otani. Or players such as Darren Dreifert, Rick Ankiel, James Loney and most recently Alex Verdugo who were all equally adept on the mound as they were with the bat out of the draft. Perhaps teams will seek out players that have the skills to do both in order to save beleaguered bullpens that now pick up many more innings than they used to in the past. The current state of the Dodgers appears bleak but when you consider that they only need to make up a game in the standings per week, a post-season appearance is certainly doable. With that said, the troubled bullpen and the lack of clutch hitting has decimated the team this month of August. There's no cushion for error anymore. The boys need to step things up or they will certainly be viewed as one of the largest disappointments of the 2018 season. It's nice to see blow out games, but the Dodger's inability to push across runs in close contests is proving to be their downfall. 11-1 and 12-2 victories are rather hollow when they come in conjunction with extra inning defeats and late inning one run losses, a rather common thread this season. It is time for this team to dig deep and have a victorious run, particularly against division rivals. All is not lost, but time is running out.